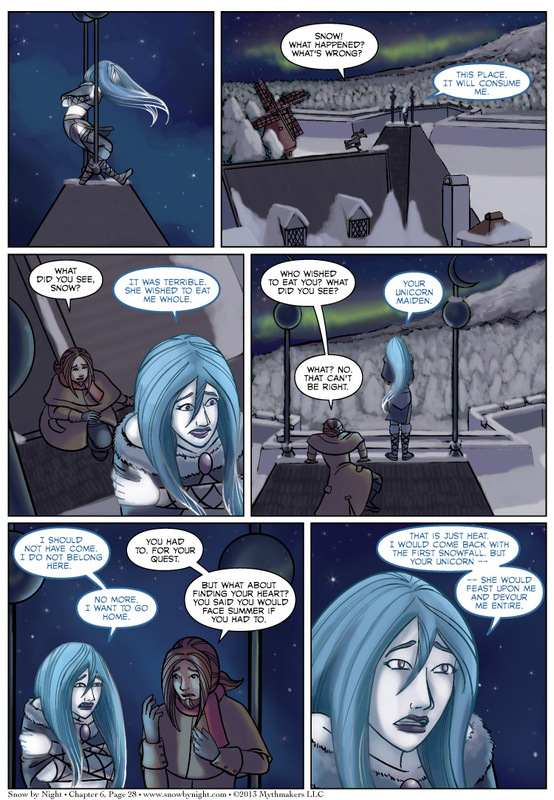 Blaise finally catches Snow-by-Night when she runs out of town on Chapter 6 Page 28. There, she confides in Blaise what she saw in the temple of Giavere and makes a startling declaration. To see the next page in progress, please vote for Snow by Night on Top Web Comics and see several panels of Brittany’s pencils. Only one more page left in this chapter. I’m afraid that Monday is a holiday for us. So our next page update is next Wednesday, May 29. After that, we start the vignette for Chapter 6, titled Winter Fantasy. It’s written by Yours Truly and drawn by the immensely talented Julie Wright. You may know her as the colorist for The Dreamer or as one of the creative pair behind Ianua. I’ve poached her for this project and I’m so glad I did. It is so dreamy. Which is good, because… well, you’ll see. Animazement this weekend. Brittany and I are off on Thursday since it’s down in North Carolina. Diane’s in charge while we’re gone. I’ll do my best to get an Almanac entry together before I go. A whole week until the final page of the chapter? Gahhhhhh, you guys are killing me! Good luck at the con! Yeah, sorry about that. Originally, this chapter was 28 pages long and was supposed to end today (before the holiday). But this final scene needed another page so the finale got bumped to next week. Oh dear… If that’s true, what is really going on in that town? So colonization clears out not just the indigenous people, but the indigenous spirits, too, eh? Well, the votaries of Giavere may invent central heating, but Father Winter will still freeze their butts if they go outdoors . . . This actually plays very well into a theory that has been crystallizing in my head for some time. We know that Japethe has no manitou (or few enough as makes no difference from mortal perspective), and we also know that Aileon’s patron spirit disappeared entirely some time ago and her religion collapsed. I think the Japethan great spirits *are* manitou themselves, but very much dislike one another, and have for a very long time been engaged in a Highlanderesque there-can-be-only-one rivalry with one another, and consumed all their lesser counterparts in Japethe long ago. It appears that Aileon’s spirit at some point fell victim to one of the others, but for the most part they are currently at a stalemate amongst themselves. Taking this a bit further, it is also possible the Japethan empires are being manipulated by their respective great spirits, each in an attempt to weaken the power base of the others. It is likewise entirely possible that the colonization wave into Everique was originally precipitated by one or more of the great spirits looking outwards for a new source of aether with which to overwhelm their rivals — though as we know from our own history, mortal kings need very little prompting when it comes to the possibility of vast new lands and wealth. If this is true, every single man, woman, and child in Japethe (with I suppose the exception of the Aileonians) is and has always been the pawn of their respective god. It’s a fairly chilling thought. Can Manitous devour each other´s aether? I do remember Chugan being being mighty interested in “having” Snow in a way that scared her. He didn’t specifically say “devour”, but it certainly could be the case. Meh, wrong unicorn. Should’ve got Tanith Lee’s Black Unicorn. So Giavere does like manitous . . . for dinner. So it looks like they’re finally making progress finding her heart. If she was only going along because she had nothing to lose, then she was unlikely to ever succeed. Now that she knows fear, she only has to find something that would make her risk Giavere’s wrath. Whatever such a thing is, if not her heart, is at least very close.